As the days get ever-so-slightly shorter, commitments increase. I’m not sure why that is. But suddenly it seems there is less time for more things to do. A visit to McGinnis Slough had been on my mind for weeks ever since the last time I drove by the entrance was closed for paving the driveway, and there was no access. I got up as early as I could Sunday morning to visit the Slough and then the Portage. I think the last time I posted from the Slough, I was commenting on the low water levels following perhaps a flooding situation. But the summer weather since has not been kind to the Slough. Indeed it is all overgrown and there is barely any water, so all the birds I would normally see have gone somewhere else. There were Mallards and Wood Ducks. I saw two distant Great Egrets, but no Great Blue Herons. Normally the slough would be hosting scores of these herons. No such luck this year. Perhaps indicative of the situation was the first bird I saw, the bedraggled-looking Northern Cardinal below. There were a few blackbirds around too, but the breeders are gone. When not distracted by birds, the vegetation grabs my attention. Could this be a new grass taking over? I think it is Bristly Sedge. There were more Cedar Waxwings (below) than any other species. I can only assume they were cleaning up whatever mulberries the robins, who were absent, had left behind. That’s right, the robins that virtually take over the landscape have all gone somewhere else. I’m envisioning large fruit-eating flocks already in mini-migrations. The theme for the day, perhaps, was shaping up. These were young birds starting to find their way in the big wide world, like the Eastern Kingbird below. And the scraggly youngster below appears to be a young Great Crested Flycatcher. I expect to see a lot of juvenile Indigo Buntings in the next few weeks, but Sunday just about the only bunting I encountered I could barely see. I was happy to see a Turkey Vulture (adult) in the neighborhood. I think seeing so many different vulture species in East Africa years ago instilled a love and respect for them. Lately I have seen groups of these hanging out by the highways, where I’m sure they make a decent living off of roadkill. The most accommodating bird at the Portage was the cardinal below who was singing with his back toward me but I guess that feeling of somebody looking at you caught his attention and he turned his face toward me. Starting this Saturday, I will be leading weekly bird walks in two alternating locations. 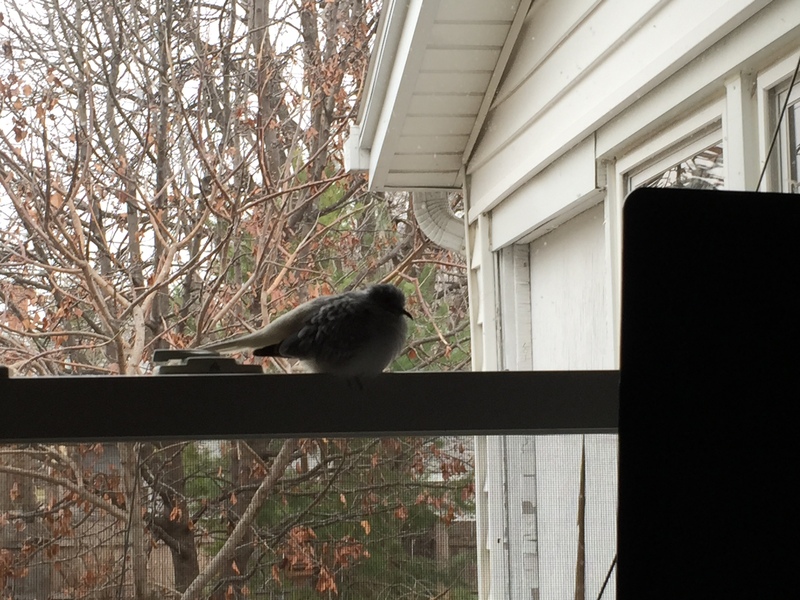 I was recruited for this position by a fellow bird-watching choir member. We’ll see how it goes. I plan on taking the camera with me, but the leading and listing responsibilities will make photography challenging. If nothing else, I will become more familiar with the two destinations which up until now I have rarely visited. The whole purpose of this is to catch the fall migration wave. I promise to report back as often as possible. I almost forgot my little insect sampler from the Portage. Worth mention, perhaps, is the fact that there were at least 20 Monarch Butterflies. But it’s still hard for me to believe that is a larger number than I have seen all summer. So as we experience the changes in the weather, the environment, the species we see… the changes are unsettling, but that’s still another glass is half-empty/half-full quandary. My last thought is a little summertime-feeling music – Trois Gymnopedies by Eric Satie. The recording is from almost 4 years ago when I had fewer birds, it was the start of the second flock, and most of the Zebra Finch solos are the beginnings of my star singer, Arturo Toscanini, whose songs have progressed far beyond this and they continue to grow. One of these days I’ll have to see if I can trace the evolution of his song cycle. Life takes its twists and turns and I never know whether I’m going to wake up dreading the inevitable or embracing the challenge – or stuck somewhere in between. Over the Thanksgiving Day holiday I had time to play piano for the birds…and to again ponder the sad state of my Yamaha P150 which I purchased perhaps 15 years ago, as a dealer’s floor model, and in the past half year or so was no longer inspiring to play. Sometimes it seemed to take forever to warm up to volume. And now a key was sticking, or stuttering loudly. Servicing would probably fix all this, but I would have trouble moving the keyboard into the car, let alone finding someone to service it – not to mention however long that would take, and I would be without an instrument to play. 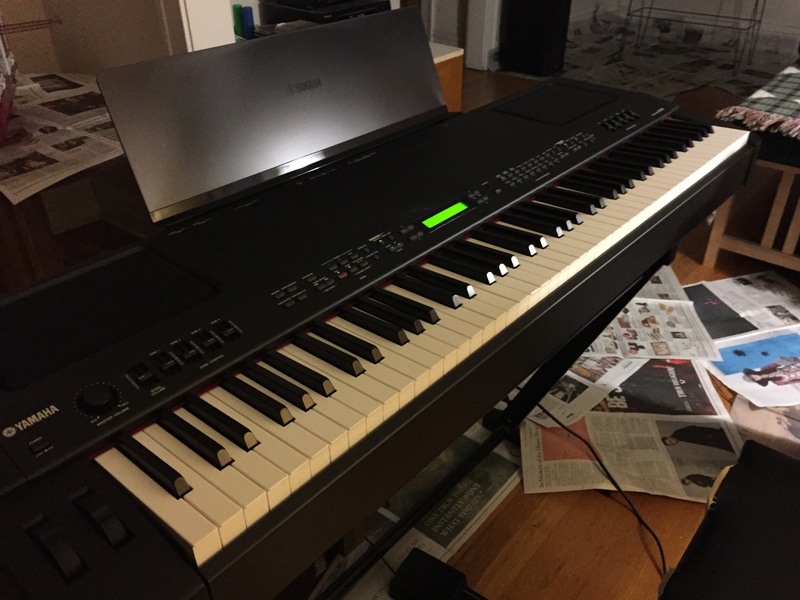 So as I was looking about for some help with the existing instrument I ran across testimonials about the Yamaha CP300, which apparently has been out for years (but so have I) – and when I read a review from one concert pianist who said he prefers practicing on this instrument, it was all over. Why not get one? About the cost of another trip to Costa Rica, which I am not doing right now: and it would last me a lot longer than a one-week trip. Knowing the quality of Yamaha’s keyboard instruments, I had absolutely no hesitation to simply press the button and order the new piano keyboard from Amazon.com. The biggest obstacle was figuring out how to be home for the delivery, because if nothing else I am no longer capable of handling a 94-pound dead weight myself. And UPS, which gives me warning a day in advance when it will be delivering something as unimportant as a calendar, gave me no warning what time the delivery was going to be attempted. I left work early after tracking the package but missed the driver by half an hour. Luckily my friends Linda and Ed Rios came to my rescue and we picked up the piano from UPS the night of its missed delivery. I made the recording above of Eric Satie’s Trois Gymnopedies yesterday afternoon. I have never learned it well enough to memorize it, so there are page turns, but the birds are singing along here and there. I am in love with the new instrument and I feel like playing again. So much so that I have decided to alter my work schedule a bit in January so I can come in half an hour later a couple days a week and play in the morning before I leave for work. It is a shame to have only the weekends to play and then if I am doing something else in the morning being too tired or busy to play later. I’ve been able to play more this weekend because my mobility has been compromised by some issues with my right knee. So except for the pain it’s been a relaxing weekend with lots of naps and hanging out with the indoor crowd as I get to know them better. I will see a doctor tomorrow and ask for a shot and an opinion, so I can get back to walking at my usual clip. Now for a word about Dudley the Diamond Dove. 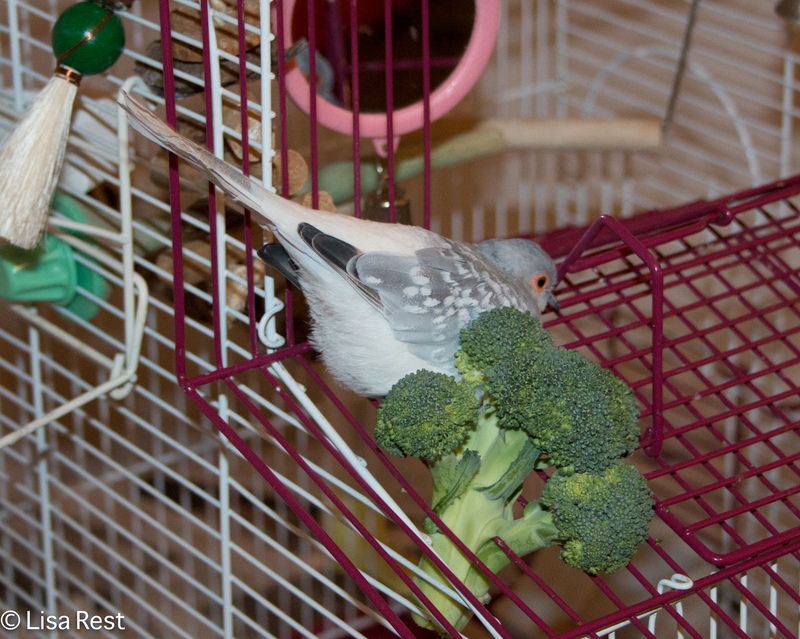 Dudley started laying eggs a couple weeks ago…so she is now Dudlee. 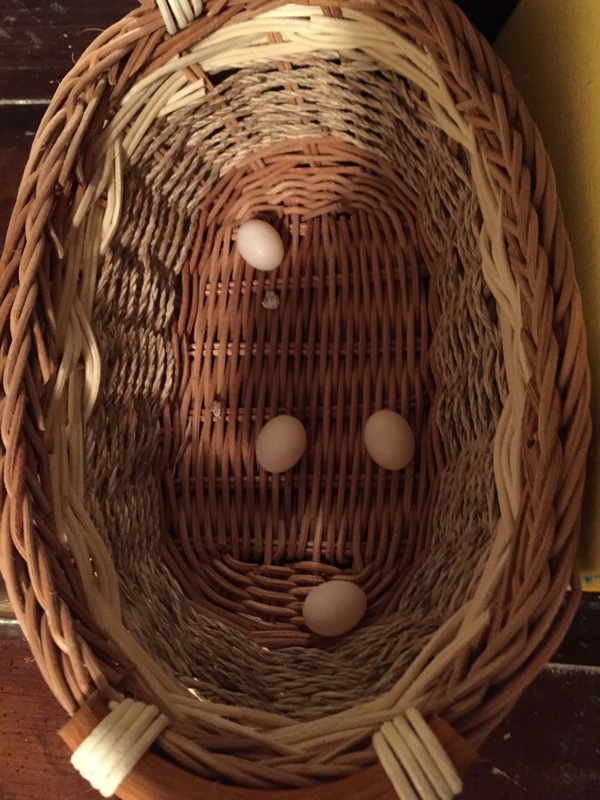 I know of two additional eggs that have broken because of where she has dropped them. I have a lot to learn about doves. Apparently with Diamond Doves, both sexes sing. And Dudlee has two sounds. One vocalization is akin to blowing on an empty bottle. But the other is a lovely coo, and it’s always two notes. You can hear her sing it in the video below. I also managed to record the two male Zebra Finches tonight, whose songs are still developing. Thus I have not yet named them. They seem to spend a lot of time fighting over territory, which involves chasing and cursing each other, but they have not come to blows so I guess it’s just a guy thing. The first one’s song has a refrain, the cadence of which first reminded me of a Black Rail, but he is adding notes to the beginning of it, so I am hoping for a name to reveal itself soon. The second one gave a little concert tonight as he foraged for nesting material. So far, the new finch hens have been laying but nothing has hatched. Could be the time of year or simply the time it is taking for everyone to get settled in. Of course Dudlee’s eggs will never hatch, but maybe her gender explains part of the special relationship she has with Blue the lone budgie. 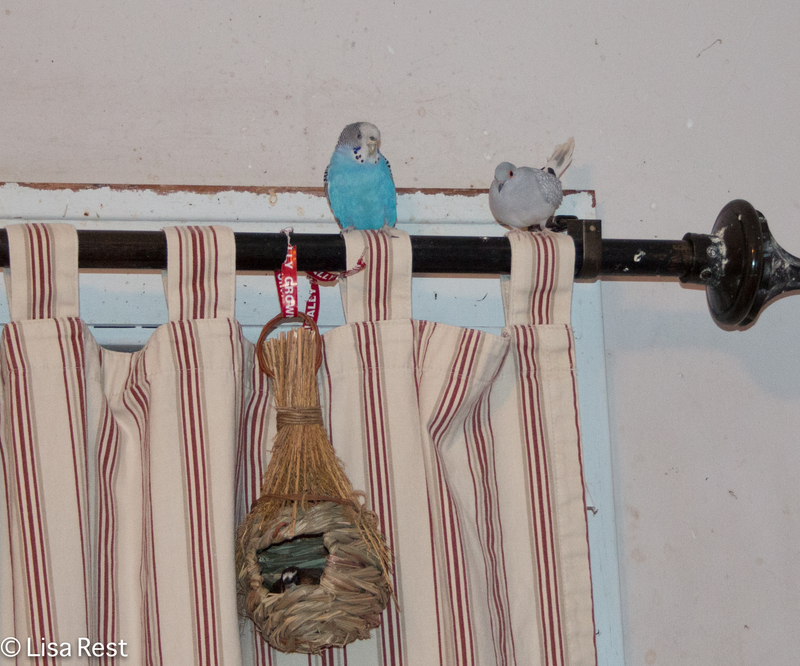 She and Blue now share a perch at night and they sit feather-to-feather. Things are getting back to normal on the most important level: I am playing music for birds again.